Jessica at Life as Mom began a new series on ways to be more joyful as a mom. My love of all foods featuring a chocolate and peanut butter combination is shared by Sherry at Lamp Unto My Feet. This Chocolate Peanut Butter Cake is sure to be a winner! This week I was honored to receive two blogger awards. 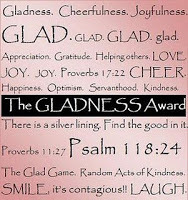 The first was the Happiness Award from Katie at Blessed Femininity. Katie is one of the most encouraging friends I’ve made through blogging and I am touched by her acknowledgement. 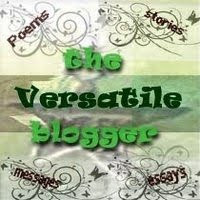 The second was the Versatile Blogger award from the sweet and talented Esther at for such a time as this. I want to say a big “Thank You” to both of these ladies for their recognition! I hope you’ll pay their blogs a visit as well! After spending WAY too much money at the farmers market this morning, I’m declaring next week an “eat from the pantry and freezer” week! Besides doing laundry and cleaning house, I’ll be spending part of today planning our meals for the upcoming week. Read what makes Nan at Mom’s the Word a “mean” mommy and see if you’re one, too! A Wise Woman Builds Her Home shares how important it is to keep our homes at the top of our priority list in A Wise Mother Guards Her Time. Lynn at Lynn’s Kitchen Adventures made this Strawberry Cobbler that I want to try! Lastly, a big thank you to Tidy Mom! I won a $50 Chili’s gift card in a giveaway she hosted recently. Happy Mother’s Day to all of you moms! From a few moments alone to breakfast in bed to a bouquet of flowers to a tight hug from your child, may you receive something that bring you pleasure this weekend! Ponder this post on Growing Up from my sweet new friend Esther at For Such a Time as This. Laura at Heavenly Homemakers gave me some answers as to what are the most nutritious sweeteners. Need a little help with organization? Planning with Kids shares 10 Things to Do Before You Go to Bed. If you have a little girl, you must check out this Princess Tea Party of the Year at TSJ Photography. I was amazed at the stunning celebration she hosted for her daughter’s birthday! We’ll be filling buckets (and our tummies!) with strawberries as we head to a u-pick farm this morning. Hope you have a lovely weekend! 5 Minutes for Mom is hosting the Ultimate Blog Party 2010 where hundreds of bloggers have linked up to share their blogs. It’s a great way to “meet” new friends and find encouraging and inspiring blogs to read. Here are a few I’ve been enjoying. Julie at Come Have a Peace talks about fostering spiritual growth in our children this spring. Find out how to use tote bags to keep things organized at Momma Mindy’s Moments. Jo-Lynne at Musings of a Housewife is sharing the importance of planning ahead in her series on Raising Responsible Kids. The Stay-at-Home Missionary is also in the midst of a series; hers is entitled Practical Vision for Young Moms. This week she discusses one of the obstacles young mothers face – feeling overwhelmed. As I take time to reflect on my Saviour’s death, burial and resurrection during this Easter season, I am humbled by God’s sacrificial love, grateful for His forgiveness of sins and thrilled by Jesus’ victory over death. I trust that you will celebrate with a heart full of the mercy, grace and peace that only He can provide. The post I wrote recently on innocence was sparked by Gracefull Girl’s thoughts on Little Girls and Lip Gloss. Kristi at Today’s Housewife shares The Challenges and Blessings of One-Income Living. Just Another Mom of Two tells us what to do on the days we feel we just need a break! Finally, Making Time for Mommy touches hearts with Ten Things My Mom Taught Me About Life. We’ll be spending part of today at my daughter’s piano competition. Hope you have an equally interesting weekend!! 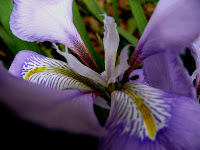 Here are some articles that I found interesting around the blogosphere this week. Simple Mom’s post on 10 Great Authors in Children’s Literature was a good resource for those of you looking for writers of children’s books who consistently produce good stories. Amy at The Finer Things in Life is doing a series on Mommy, Come Home which deals with leaving the work force and becoming a stay-at-home mom. One of this week’s posts was perfect for those who may not yet have children but want to prepare ahead of time so they will be financially able to stay at home with their children in the future. Although it may be a little late to use these ideas for this July 4th celebration, I loved the decorations shown in this post – Hooked on Red, White and Blue. Finally, do you ever feel like a crabby mom? I do, more often than I’d like to admit. Jessica at Life as Mom has some suggestions for being a more cheerful mom. I would like to add a few more blogs to my reader so if you have any suggestions or would like to share the link from one of your “must-read” blogs, please do so in the comments section.